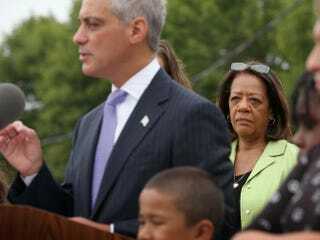 Chicago Public Schools CEO Barbara Byrd-Bennett, center rear, listens as Chicago Mayor Rahm Emanuel announces additions to the city’s all-day kindergarten program during a visit to the city’s Tonti Elementary School on Aug. 5, 2013. Chicago Public Schools Chief Barbara Byrd-Bennett on Friday began a paid leave of absence amid a wide-ranging federal investigation of her inner circle of advisers and a $20.5 million no-bid contract awarded to an education consulting firm that once employed her, according to ABC 7. "In light of the federal investigation and its impact on her ability to effectively lead this district, Dr. Barbara Byrd-Bennett advised me that she would like to take a leave of absence from the Chicago Public Schools, and I have agreed to that," Chicago Board of Education President David Vitale said at a news conference Friday afternoon. Byrd-Bennett, who draws a $250,000 annual salary, will begin her leave Monday, when Jesse Ruiz, the board’s vice president, a former Illinois Board of Education chairman, is set to take over, the news outlet reports. The Chicago Tribune reports that Ruiz and Vitale were among officials who voted 6-0 in 2013 to approve the awarding of a contract to the SUPES Academy training organization, which is at the heart of the federal inquiry. Vitale said at Friday’s news conference that the board knew that Byrd-Bennett worked as a “mentor-coach” for the academy before the district hired her and that it saw no conflict when approving the contract without opening it up to competition. Federal subpoenas of district employees seek materials pertaining to the SUPES Academy and related entities, including Proact Search and Synesi Associates, which also have won CPS business, the Tribune says. Additionally, authorities are demanding school district records related to the Chicago Public Education Fund, a philanthropic group that over the years has counted among its board members Illinois Gov. Bruce Rauner, billionaire investor Ken Griffin, U.S. Commerce Secretary Penny Pritzker, Vitale and Mayor Rahm Emanuel’s chief of staff for education. The group has provided funding for SUPES Academy. Among CPS employees called to appear before a grand jury is James Bebley, the school board’s general counsel. Also receiving grand jury subpoenas were Byrd-Bennett’s chief of staff, Sherry Ulery, and Rosemary Herpel, a district employee who worked with Byrd-Bennett during her earlier leadership stints in Cleveland and Detroit, the report says. Emanuel, who hired Byrd-Bennett in 2012, was out of town Friday, but his office issued a statement endorsing her decision to take leave. “Though there have been no formal allegations, the mayor has zero tolerance for any type of misconduct from public officials and welcomes today’s decision to help ensure this issue does not distract from the incredibly important work happening in our neighborhood public schools,” Emanuel's office said in the statement. Read more at ABC 7 and the Chicago Tribune.